My rich, flavorful gingerbread cake has ALL the holiday spices you love. 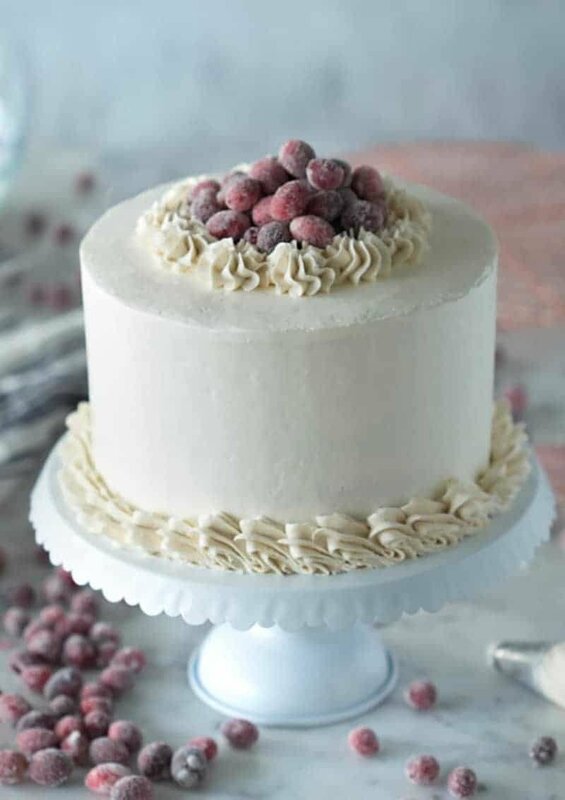 It’s paired with a zesty lemon buttercream and a creamy, spiced Italian buttercream all topped by a nest of sparkling cranberries. This cake is so packed with flavor, it’s pretty outrageous. I paired it with a super-zesty lemon buttercream and then encased the whole thing in a spiced Italian buttercream. My secret ingredient? Cardamom, such a good spice and I don’t think it’s used enough, including by me! I was a bit stumped for the decoration, I tried so many things, there are even a few buttercream pine cones in the freezer which did not make the cut… In the end I really love the sparkling cranberries nested on top of the cake, they’re like little balls of Christmas!! I remember making, to my memory, elaborate gingerbread houses before Christmas when I was a boy. Pre-made gingerbread panels (it was the 80’s), royal icing and lots of colorful gummy candies for decoration. Those were the days… I still love gingerbread but so many of the store-bought offerings are a bit off, some are stale, some are dry, some have toned down flavors etc etc. For my cake I wanted to amp up all the spices and make it very Christmassy but still have a clean, classic look. How do you make a gingerbread cake? Preheat oven to 350F. Butter and flour three 8″ cake pans. Combine boiling water and baking soda in a medium bowl. Sift together the flour, baking powder, ground ginger, cinnamon, cloves, nutmeg, cardamom, allspice and 3/4 teaspoon salt into a large bowl. Using a standing mixer with a whisk attachment beat the butter on high until light and fluffy. Add the sugar and beat for about two minutes. Add the molasses, grated ginger, baking soda mixture, and flour mixture. Beat in the eggs. Divide the batter evenly between the three pans and bake from about 30-35 minutes or until a toothpick inserted in the centers will come out clean. Allow cakes to cool in the pans for about 10 minutes then turn out onto wire racks to cool completely. 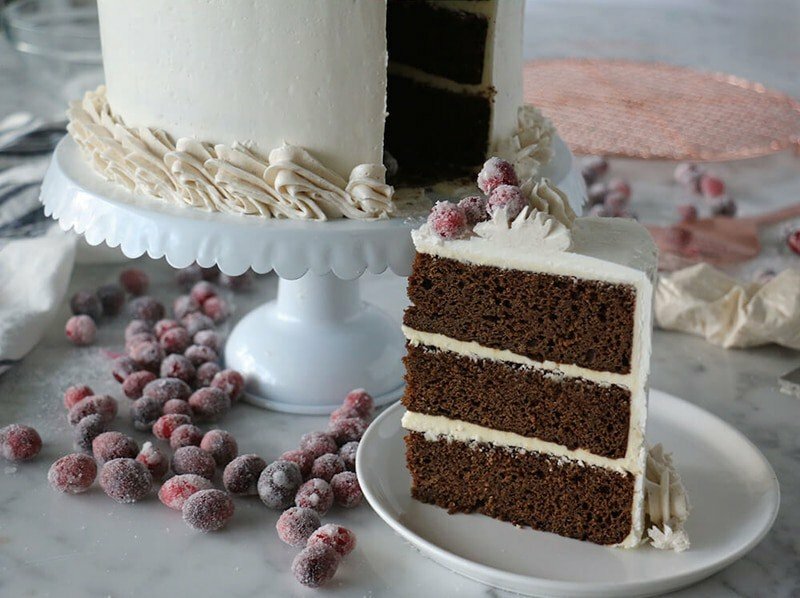 Can gingerbread cake be frozen? For best results freeze the cake layers and frosting separately. Allow the buttercream to come to room temperature, whip briefly to restore consistency and assemble. A fully assembled and decorated cake can be frozen. You should chill the cake first then wrap well so as not to distort the buttercream decorations. Frozen cakes can be kept for up to 6 moths but I recommend 6 weeks as a best by date. What flavors pair well with gingerbread? The zing of lemon pairs wonderfully with the rich spices of gingerbread, but a mellow vanilla also provides a nice balance to all the spice. If you don’t want to make Italian buttercream you can use the American variety. I just prefer the smoothness and taste of the Italian variety. I know it’s a pain to make two different types of frosting though! Check the below video out for a FULL how to on making Italian meringue Buttercream. 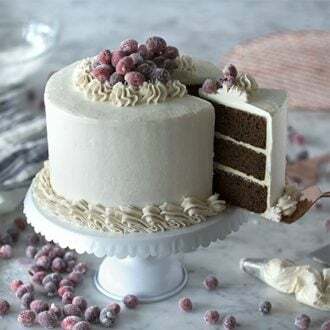 A rich and flavorful gingerbread cake paired with a zesty lemon buttercream and a spiced Italian buttercream all topped by a nest of sparkling cranberries. Preheat oven to 350F. Butter and flour three 8" cake pans. In a stand mixer fitted with a whisk attachment cream the butter. Add sugar lemon zest, lemon juice and then add cream until desired consistency is reached. Run mixer until merengue is cool/tepid. Add the salt and vanilla if using. Add the spices and mix until combined. Heat the sugar and water to a boil and allow to cool to room temperature. Toss in the cranberries and allow to soak. Preferably for a few hours or overnight if possible. Move to a wire rack and allow to dry for one hour. Toss a few at a time in sugar and set aside. Cake recipe adapted from Martha stewart. Sparkling cranberries are so easy to make and they’re excellent snacks. As you can tell from the final photo, I made too many, but have adjusted the recipe accordingly. Just a closeup of my little cranberry nest. I loved how easy it was to make these dollops, all it took was a little wiggle! Transfer lemon buttercream to a piping bag. Pipe buttercream between each layer. Pipe Italian buttercream around the outside of the cake. Pipe continous dollops around the skirt of the cake. Pipe a ring of dollops on the top of the cake, add cranberries. Alter the spice profile as desired use more of your favorites and eliminate the ones you don't like! Perfect timing!! How beautiful! I’ve tried two other gingerbread cake recipes this week and neither worked so I’m looking for the holy grail of recipes 😉 Both recipes caused major sinking (a first for me after tons of cakes). Your layers seem to have risen perfectly! I’m guessing you haven’t had any signs of sinkage troubles with this recipe…? I didn’t encounter any sinkage with this cake because I always use my trusty cake strips! Let me know how it turns out! Hope you enjoy! Hi John- You left out the butter in your Italian buttercream recipe. Thanks for pointing that out! Use 16 oz of unsalted butter for the Italian Buttercream! You don’t need to cream the butter before! Maybe try sifting your dry ingredients before adding them in next time! The lemon buttercream is piped between each layer and the Italian is used to coat the outside of the cake! The baking instructions are before the buttercream instructions! Hope you enjoy! This turned out beautifully! The lemon buttercream is to die for! I made it for a friend so won’t know how it was for a bit. I posted a picture on insta and tagged you. There are a couple of recipe discrepancies-all the spices in the cake ingredient list are not in the directions, so I didn’t notice until it was too late. Also, the Italian buttercream directions mention salt and vanilla but are not in the ingredient list. 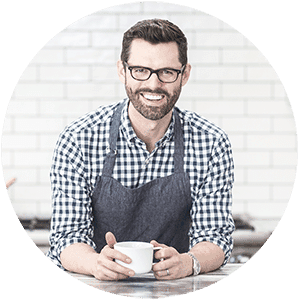 Thank you for the great recipes and notes and tips-very helpful! Thank you for bringing this to my attention! I added the two missing spices and corrected the buttercream list. I hope your friend still enjoyed the cake!